Forest research is critical for forestry and natural resource management. But, as a recent survey among IUFRO member organizations – universities and research centers – clearly shows, forest research can no longer be viewed in isolation. It is being more and more recognized as part of a larger context and has become increasingly cross-sectoral. Also, new research priorities are emerging and will dominate the research agenda in the future. Among these new topics, biodiversity, ecosystem services, social issues and especially water rank high. Clearly, climate change and global change are the most important drivers for future research in forest organizations. In view of these changes, forest research institutions need to take a more holistic approach and also better understand the importance of science in decision-making through outreach and communication. And, of course, they need to demonstrate the relevance of their research. This is especially true when it comes to funding. In his talk on “Similarities and differences of global networking vs. business driven research”, Mike Wingfield, IUFRO President and Head of FABI, South Africa, stressed the need to find a balance between public funding and private business funding. An excellent way of harmonizing public and private funding is for governments to give incentives to the private sector to fund research. One way of better involving the business side is through proper communication. Researchers should understand the language of the business community – and of policy makers – and explain to them in their language what science can do for them. 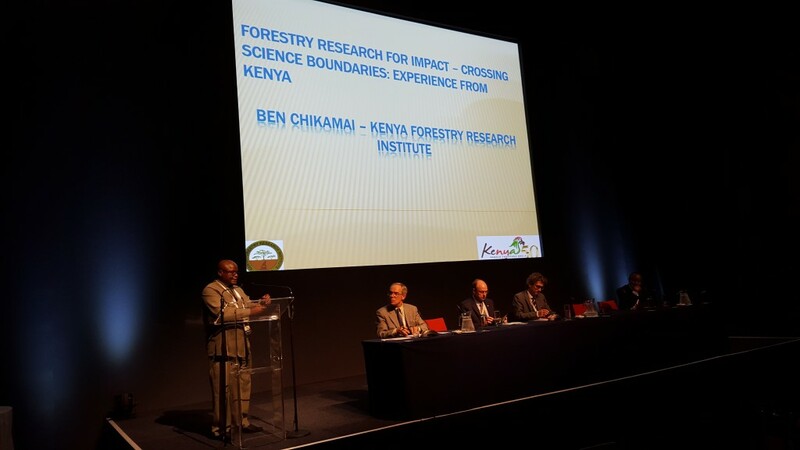 Ben Chikamai, Director of the Kenya Forestry Research Institute (KEFRI) talked about “Forestry Research for Impact – Crossing Science Boundaries: Experience from Kenya”. He showed some very good examples – e.g. of forest restoration and rehabilitation, or control and management of invasive species – where forest research was put into practice and had a most valuable and visible impact on the ground. Victor Agyeman, the Chairman of FORNESSA, a regional group of forest research institutions in Sub-Saharan Africa made of 106 institutions from 36 sub-Saharan countries, explained the value of networking. Africa has one of the weakest capacities for scientific research, including forest research. For example, Africa only produces 2% of research publications worldwide and contributes less than 0.1% of the world’s inventions. A regional network such as FORNESSA can help to support capacity building, compensate for limited financial and human resources and, take part in global research collaboration, for example through IUFRO. What is the IUFRO Directors Forum? The IUFRO Special Programme Directors’ Forum brings together heads of forest research institutes and deans of forest faculties, and provides a platform for the exchange and development of views on the management of forest research. It also aims at an active exchange of views with policy and business experts and decision makers as well as with NGOs and other groups of civil society.